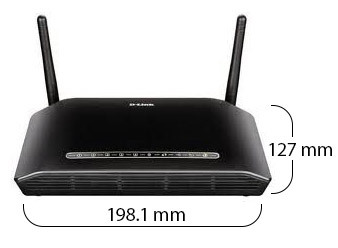 The D Link DSL 2750U WiFi Router lets you share high speed wireless Internet connection with friends and family at over 300Mbps speeds. Its ADSL2/2plus standard provides Internet transmission of up to 1Mbps upstream, and up to 24Mbps downstream. It is ideal for use whether your Internet connection is Broadband Ethernet or ADSL. You can even connect the router to other peripheral devices via the onboard four port Ethernet switch. The device’s USB Share Port enables you to share contents of your external hard disk drive or flash memory on your network storage for others to access. You can rest easy knowing your data is secure with only authorized users permitted to access it. The advanced router offers firewall protection and quality service for downloading / uploading of files, music, photos, videos, and email over the Internet in as fast, smooth and secure manner. The device is capable of producing wireless speeds that are up to 5x faster than conventional routers. You can amplify its performance by pairing the router to computers with wireless N interface.